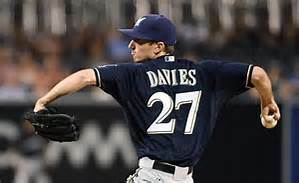 Milwaukee Brewers rookie pitcher Zach Davies had an 11-7 record and 3.95 ERA this season for the team. He became the 14th Brewers rookie hurler in team history to win 10 or more games in his first season, and he led the Brew Crew pitching staff in wins with his 11 victories in 2016. He became only the second pitcher in Brewers history to outright lead the Brewers pitching staff in wins since Teddy Higuera led the staff with 15 wins in his rookie season in 1985. (Note: Three Brewers rookie pitchers tied for the team lead in wins in a season… Don August (1988), Ben Sheets (2001) and Steve Woodard in 1998). Davies 11 wins ties him for fourth place on the team list for most wins by a rookie pitcher. Higuera tops the list with 15 wins in 1985. Here are the 14 pitchers who won 10 or more games for the Brewers in their rookie season. Four of the above pitchers finished in the Top 5 for Rookie of the Year voting that season: Higuera and Parsons both finished second; August and Eldred finished fourth. We’ll see how much support Davies gets in this year’s N.L. ROY voting. Of the 14 pitchers above, can you name the only one to go on to win over 100 career games with the Brewers? If you guessed, Slaton, you know your stuff! Slaton, who pitched 12 of his 16 seasons in the majors with the Brewers, went on to win 117 games with the Brew Crew in his career, the only pitcher from the list above to reach 100 wins with the team. Here are the number of career wins with the Brewers the 14 rookie pitchers who won 10 or more as rookies ended up with during their Milwaukee career: Slaton (117), Higuera (94), Haas (91), Sheets (86), Bosio (67), Eldred (64), Peralta (42), August (34), Nieves (32), Parsons (29), Plesac (29), Parra (26), Woodard (25), Davies (11)*. As you probably noticed, Dan Plesac won 10 games with the Brewers in 1986. Used primarily as a reliever in his career (he did start 14 games in his MLB career), Plesac is one of only 19 pitchers to ever tally 10 or more wins and 10 or more saves in his rookie season in the majors. Plesac had 14 saves to go along with his 10 wins in his rookie season with the Brewers in 1986. Plesac is one of six Brewers rookie pitchers who had 10 or more saves in their rookie season with the Brewers. Topping the list is Jim Henderson who had 28 saves in his rookie campaign in 2013 with the Brewers. Here are the six Brewers rookie pitchers with 10 or more saves.